RIP: The Last Karaite Shochetet? 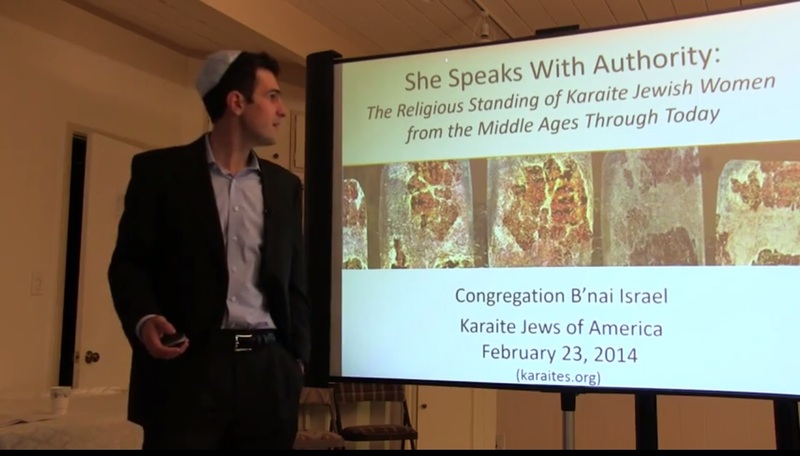 From my talk on the role of women in Karaite Judaism. I haven’t been on this intense Karaite journey for too long; so I still get surprised by interesting facts on a regular basis. 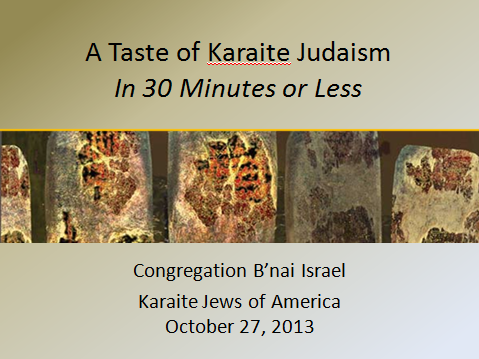 But during my recent talk on the religious standing of women in Karaite Judaism, I was surprised by what surprised me. This is the second (and, for now, final) post related to the Karaite Studies: The State of the Field workshop held in Israel in early 2012. In this post, we’re picking up where we left off by summarizing and annotating the second half of a question-and-answer session between Rabbi Moshe Firrouz, the Chief Rabbi of the Karaite Council of Sages, and various attendees at the workshop. Based on the number of views, the post on the first half of the question-and-answer session was a hit, and YouTube has a video of the entire session. A little background is necessary before jumping into this post. A lot questions relate to ritual purity. 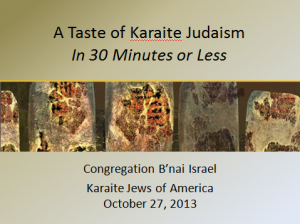 Karaites generally concern themselves with ritual purity more so than Rabbanites because the traditional Karaite view is that one may not enter a holy place (such as, in the Karaite tradition, the sanctuary of a synagogue) while ritually impure. We’ll discuss this issue in more detail in a later post. Other topics in this post relate to Karaite butcher shops, mikvehs, fertility, and even the permissibility of pets. For today, I’ve created cliff notes and commentary (not to be confused with an oral law) for the first half of a question-and-answer session between Rabbi Moshe Firrouz, the Chief Rabbi of the Karaite Council of Sages (Hebrew: Moetzet HaHachamim), and various researchers and academics in attendance at the workshop. The topics covered in this post range from women in Karaite Judaism; Karaite Torah scrolls; rebuilding the Temple in Jerusalem; and efforts of the Karaite community to maintain its halakha (religious interpretations), culture and traditions. Abraham ibn Daud was an ardent Rabbanite Jew living in Spain during the 12th Century and his brief rendition of the history of Karaites in Spain has always intrigued me. According to Ibn Daud, the Karaite Jews of Spain once had a female leader. The Karaite community referred to this leader as “the Teacher” (Arabic: al-Mu’allima) – which, interestingly, is one of the translations of the word “Rabbi” – and the Karaite community relied on her for authoritative tradition. For now, I’ll address just two of the many thoughts that come to mind.